Using the NEO6MV2 GPS Module with Arduino is pretty straightforward. This tutorial uses TinyGPS Library by Mikal Hart. The library is only for data manipulation purposes, so it is not actually required to read the data from the module. SoftwareSerial library is used for the communication. NEO6MV2 GPS module uses 3v3 logic compared to 5v which the Arduino uses. To convert the logic, we add two resistors in our wiring. Download the TinyGPS library here: https://github.com/mikalhart/TinyGPS/releases/tag/v13. Open the "test_with_gps_device.ino" from the examples folder.
" and replace it with ss.begin(9600);. Now upload the code and open the serial monitor. If the module fails to get a fix, try to use it near a window or outdoors. The fix could take several minutes. Hello, I have an example and I changed to 9600 but when I run I jump Error "'TinyGPS' does not name a type." it can be? It looks like Arduino IDE is not recognizing TinyGPS library. Have you downloaded TinyGPS library? Where did you extracted it? Which version of Arduino IDE are you using? Can u please help me know more about this module if I can put my own coordinates in this for better accuracy . I mean as I m dealing with a small campus so for navigation thing what will be best suited since the world's gps is not that accurate when it comes to precision. So please help me out in this ..
should there be any LED indication when i just supply 3.3v keeping the TX and RX open? does it glow when i just provide the Power? It is not a power led. The led indicates that the module has an active fix on gps satellites. It will blink while it has active fix, and will be off at all other times. Hello. i have some doubts regarding this module. At first i connected it using 5v without the resistors. Now i am using your method to do it. But still its not working. Does it implies that i have damaged the gps module by using 5v? Well done. You destroyed it. It uses 3.3V, not 5V. When using the tinygps simple test and printing the GPS sentences I get lots of $GPTXT lines but nothing else! This is a very much restart. Connect to the +5V to the GPS VCC. I can use 3.3V on my UNO but need to connect to 5V on my NANO. Try to change "...find the code "ss.begin(4800)" and replace it with ss.begin(9600')" as stated bove. It worked (got a reading instead of *) for me. So I am getting the same output, and yes i changed the 4800 to 9600. Can anyone help me out with this ? Step I : Download the zip and unzip it any directory. Step IV : Now open your IDE and in File option go to examples. In that go to TinyGPS-13 and choose "test_with_gps_device" and upload. Step I : Download the zip and unzip it in any directory. I can confirm that I had to wire the GPS device to the 5V pin on my Arduino Nano for it to work, got a fix within a few seconds with the antenna attached. When wired to the 3.3V pin the device never got a fix. Yes this should work with any arduino board. The title says UNO, because I used UNO board in the wiring drawing. Does this mean its working but not getting a fix? Hi, where can I find the NEO6-MV2 part file for fritzing you used to draw your schema? I had the same question with you before. But I realized that the author used another module GPS in Fritzing to draw and just put the label NEO6-MV2 on it. I also could not find this part on the internet too. He might find it, so let's wait for his reply. Thats right, I couldn't find it so I took some other gps module and just put the label on it. which gps module did you put the label on and how did you put the label? you are the best, nice resistor scheme, manufacture dont show this and without this the gps dont show lat/long. Hi I used this gps with out the resistor with simple code on atmega and it shows the result this very simple to test the module. You need to install tinyGPS library. Search on google for tinyGPS library and install it. Try the Ublox ucenter gps program. works fine. Can be downloaded from Ublox webside for free. Ive connected it all up as per the instructions but am just getting all this endless text in the serial monitor??? Have you tried to install uBlox uCenter on your Pc and connect the gps, to test and see that all works and that you get a fix on your location? If that works, then it must be a sketch issue. How long does it take GY - GPS6MV2 to be in use ? or LED indicator active satellite ? It should start after a few seconds and start to get fix on satellites after about 30 seconds. but if you are inside a building it could be an issue, try to take it outside or out a window for a test. Thanks! Very helpful input from all contributors helped me to get this running! Without it, I would have been very confused, and the Blue Smoke Monster would have claimed another victim!!! It works from Serial rate 9600 through to 115200 - with the TinyGPS 'test_with_gps_device' sketch. I've tweaked it to give Time & Date to a 2.8" TFT Screen. Using the resistors and an ATmega2560 and Software Serial could not get it working so I tried different baud rates and still no success. So I tried the hardware Serial1 (Pins 19 and 18) on the 2560 and 9600 baud and it finally worked. However, I was thinking about the reason to use these 2 resistors... You did say in the post that they are to convert the logic, but its not clear for me. Really helpful information. Managed to start my NEO6MV2 GPS by following the steps from abowe. Thank you! Hi I am struggling to make my GPS module work. I am using it with Arduino Uno and I seem to be getting the following output. I have checked the wiring and infact I returned the first module back to amazon thinking it was not working. The second module behaves exactly the same. Just to let you know that I managed to get things working thanks to your explanation. Thanks a million! 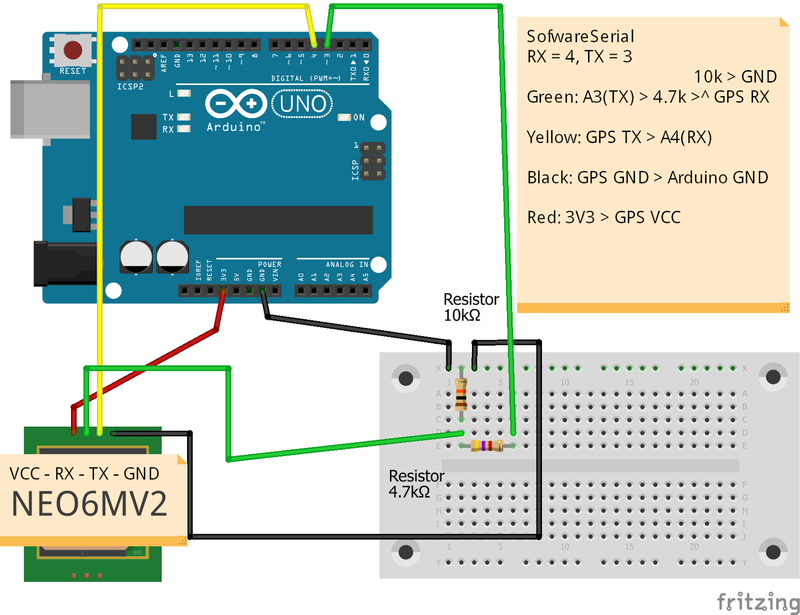 I cannot understand what is the meaning of using resistors when connecting RX in order to make it work on 3,3 Volt and you directly connect TX on the arduino, which operates on 5 Volts! hi there i m using NEO-6M GPS module and it is showing satellite count=0 in serial monitor and only 1 led is glowing on gps module we cant understand the problem can u help...? I've got the same output, please can you help me! Don't use Outputs as powersuply for the gps modules, it does not work!